I don't think anyone can disagree when I say that the 2016 presidential election has been rough, and I am not sorry to see it go. Even so, there's still something exciting about casting that ballot, despite all the stress it's caused. Without voting, there would be no free sticker, and what's better than that? Well, except maybe the satisfaction of taking part in this great nation's democratic process. And something else I'm loving this time around: Celebrities' voting photos, which are currently all over Instagram and Twitter. Being that this year's election has been so unprecedented, many celebrities are getting word out there on how important it is to vote, and obviously, they're voting themselves, too. It's awesome to see them sending such a positive message, especially if their photos could encourage someone to vote who might not have taken the time to do it before. This particular cycle might have been one of the most headache-inducing ever, but regardless of the result, we're all basically living through history, so why not participate? The Agents of S.H.I.E.L.D. star combined the superhero world with the political world. He looks kind of tired, but at least that emoji shows his feelings. Party In The U.S.A., everyone. Voting the Betty Draper way. Looks like her reading material is appropriate for today. Family voting seems to be a theme this year. Of course Connie Britton got a margarita after she voted. Don't mess with early morning voters. Even the Vulcans are turning up to cast their vote. Waiting in line would be so much more fun if Schumer was there! And with an American flag scarf to match! Do you think he voted for Mellie? I think he voted for Mellie. The sticker on the nose pose is popular this year. Just like his brother! Kevin, where you at? What's better than a voting selfie? A voting video. The couple that votes together stays together, right? Hathaway voted and looked super stylish doing it. Such an appropriate shirt for the occasion! It might just be her sticker, but it means something important. I'm a little bummed she's not wearing her "Make America Ferrera again" shirt, but whatevs. Carrie Bradshaw would probably take the same photo. Leslie Knope would be insanely excited about this election, so it makes sense that Poehler is pumped about it, too. Swift has remained pretty silent about this election, so it's good to see that she got out there and voted! Ripa voted with her son, who got to vote for the first time this year. How exciting! So many celebs had to vote absentee, but it's good to see that they didn't let those mail in ballots stop them. Speaking of absentee ballots... Germany? That's commitment. I feel like Olivia Benson would be super proud. His reason for voting was his daughter, and I love that she was included in his selfie. Come on, did you really think he was going to sit this one out? Even Avengers have to vote, y'all. The Grey's Anatomy star did not sit this one out. 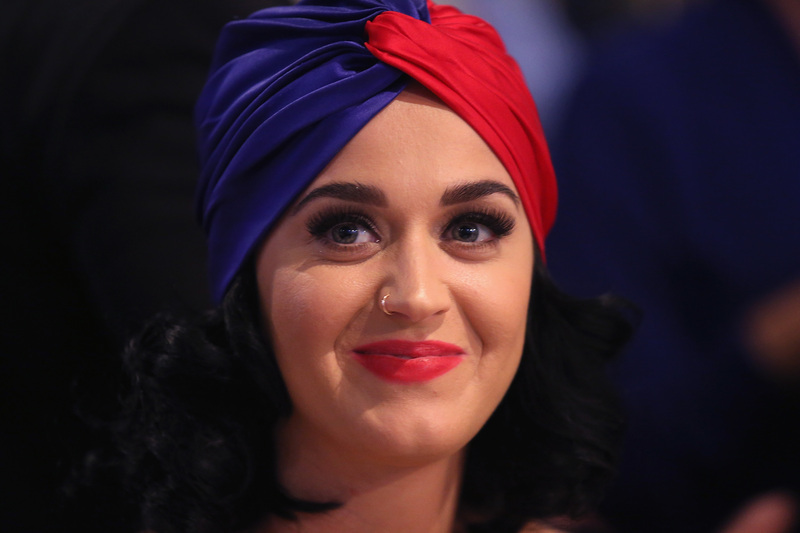 Perry has been outspoken through this entire election season, so it's no surprise that she dressed up for the event. How cute is she?! Voting on the actual Election Day is fun, but not waiting in line is even more fun. I can assure you I did not look this precious when I voted. Her husband, Justin Timberlake, may have gotten called out for posting a photo directly from the polls, but that didn't stop Biel from sharing adorable selfies of her own. Super simple but still dreamy, her voting photo basically represents her entire Instagram, aka the life I most want to live. If you've been following her on Twitter lately, you already know that Bush has many passionate feelings about this election, and I always look forward to her commentary on whatever insane but true election story has broken most recently. This Pretty Little Liars star didn't waste any time getting her vote out — and her caption is amazing, too. She may have had to do it with an absentee ballot, but it still counts! If Elsa can vote, so can you. But honestly, would it be right if the woman behind Scandal didn't vote as early as possible? You're really, really not supposed to take this kind of selfie, but I'm so glad it exists. The Room star not only waited in an insanely long line to vote, but she also ordered a pizza to share with the others in line around her. The Vampire Diaries star's selfie included a message for Hillary Clinton, in hopes that she wins. The eyepatch look is popular this year with stickers! For the record, Quinn from UnREAL totally would have voted early, too. The voice of Olaf from Frozen shared his selfie with his daughter. So adorable! And as a fellow resident of Georgia, I also got one of those precious peach stickers, too. More peach stickers! I love it! If Gaga can promote a new album and vote at the same time, the rest of us have no excuse.